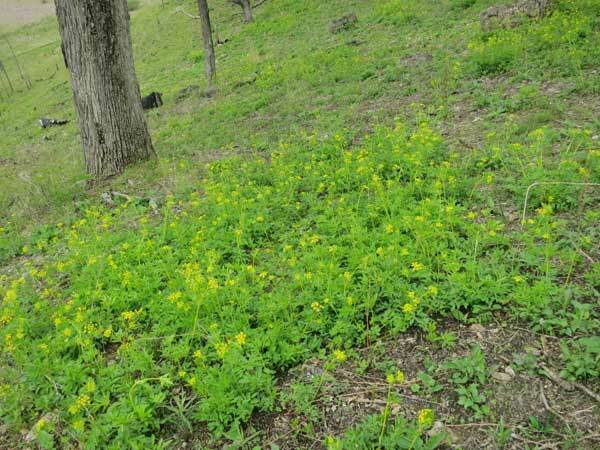 Last year I posted a blog on May 18 entitled "Wood betony time." This year, wood betony (Pedicularis canadensis) has been in flower for the past two weeks, more than a month earlier than last year! 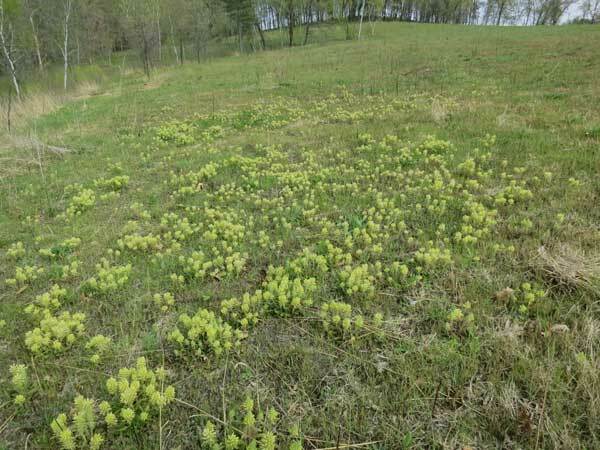 Wood betony on the north (unburned) unit at Rettenmund Prairie. Black Earth Rettenmund Prairie now has especially large populations. The whole North Unit (which was not burned) is full of wood betony. We also have some nice populations at Pleasant Valley Conservancy, and it is also prolific in other prairie remnants and planted prairies in southwestern Wisconsin. I'm not claiming this advance growth is due to global warming, but it makes one wonder. Since this site was burned early (March 13), now is the time to do a canvas for invasive plants such as remaining buckthorn (only a few), brambles, clonal species such as pale Indian plantain, and various clovers. Thistle, parsnip, and other common invaders are now completely absent. This year for the first time golden Alexanders (Zizia aureus) has formed nice large patches, so the whole slope has a tinge of yellow. Although spraying here is not exactly easy (finding a good footing is often a problem), it is a pleasure to work on such a nice slope. In addition to the Zizia, species common now include little bluestem, violet wood sorrel, rosin weed, bergamot, yellow cone flower, zig-zag goldenrod, stiff goldenrod, early meadow rue, and purple hyssop. Just nearby in the open prairie remnant are hoary puccoon, prairie dropseed, prairie turnip, and bird's foot violet. On the early morning of April 12, 2012 much of the Indian grass (Sorghastrum nutans) at Pleasant Valley Conservancy suffered major frost damage. 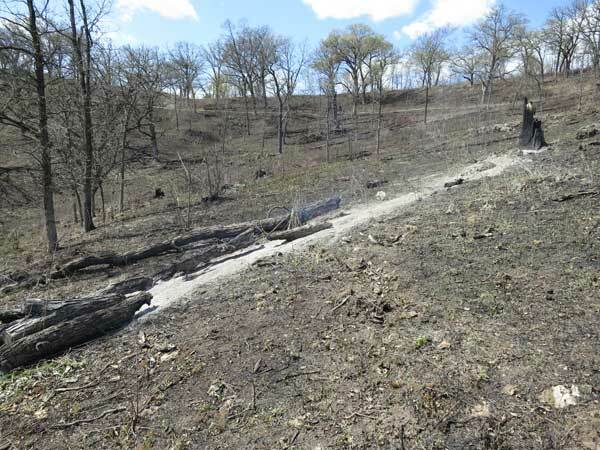 Most of the south slope as well as the mesic and wet-mesic prairies below Pleasant Valley Road were seriously damaged. The south slope looked like it had been sprayed with glyphosate! The photo above is typical. None of the cool-season grasses seem to have been affected. Also, other warm-season grasses such as little bluestem, prairie dropseed, and big bluestem are apparently fine. The early warm weather was certainly responsible. 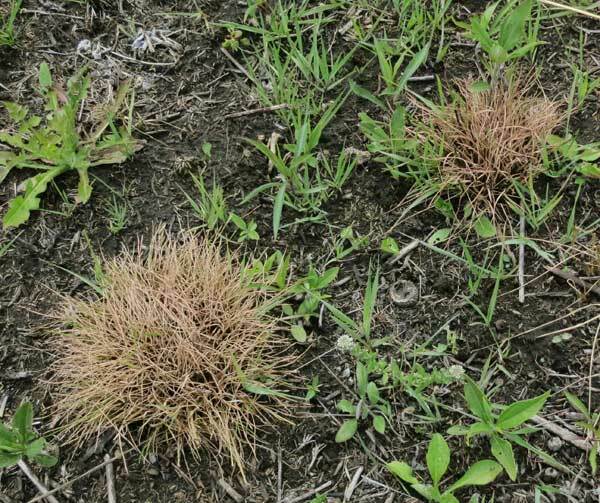 Warm-season grasses such as Indian grass generally do not start making significant growth until mid-May, but the unusual warm weather this spring got everything started early. After our very early burn on March 13, there was over a week of very fine weather, and Indian grass had a chance to get started well. We did not actually notice the effect until a week later, when all of the lower part of the south slope had patches of brown. I am not sure why Indian grass was particularly hit, but in general warm-season grasses are quite cold-sensitive. Most of the forbs did not seem to be seriously affected, although as the photo here shows the edges of the leaves of prairie dock were noticeably brown. 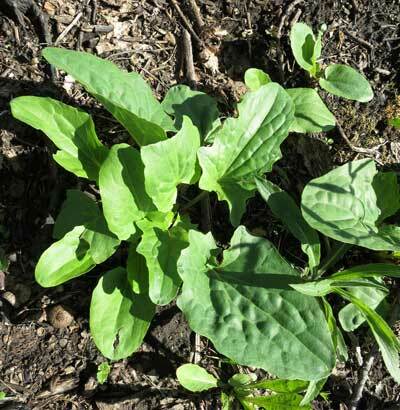 This was the only Silphium affected, as compass plant, cup plant, and rosin weed seemed fine. We haven't lost our Indian grass for good. There should be plenty of dormant buds that survived the frost and will start growing. However, growth will certainly be delayed and it will be interesting to see what our Indian grass stands will end up looking like this year. I did an extensive literature search but was unable to find any research on the cold-sensitivity of Indian grass. Prairies and savannas are not the only areas affected by the early warm weather this year. Fruit-tree growers have also suffered. And maple syrup production was almost zero. As predicted, the unusual burns this spring are having little effect on growth of prairies and savannas, and right now all sorts of good things are popping out of the ground. However, lots of invasive plants are also growing, thus bringing us to spray season. We now have a chance to kill bad plants before they get large enough to be difficult. From now until early June we'll be spraying. Any bad forb is being sprayed with aqueous Garlon 3A. This includes thistles, dandelion, English plantain, motherwort, garlic mustard (yes, we have a small amount of this), and two native species that are clonal and highly invasive: pale Indian plantain (PIP) and sunflower. Right now, most of our effort is on PIP, which starts early and sends up massive numbers of root suckers. Because we burned the Crane Prairie last November, this was the first site we worked on, but now it has been a month since our first spring burns, so any area that is in full sun is a target. One of the challenges in this work is that there are several good species whose leaves might be mistaken for PIP. Although I wanted to move quickly through the area, I wanted to be certain that none of these good plants were sprayed. Two in particular were fairly prolific and had leaves that, at a quick glance, might be mistaken for PIP. One of these is zig-zag goldenrod (Solidago flexicaulis), which is one of the earliest plants to appear in our savannas. As the photo shows, the leaves of this goldenrod are serrate, whereas those of PIP are entire, but you have to be sure to look at them carefully. Since there is lots of zig-zag goldenrod in this unit, if I sprayed one or two by mistake it would not be a major tragedy. 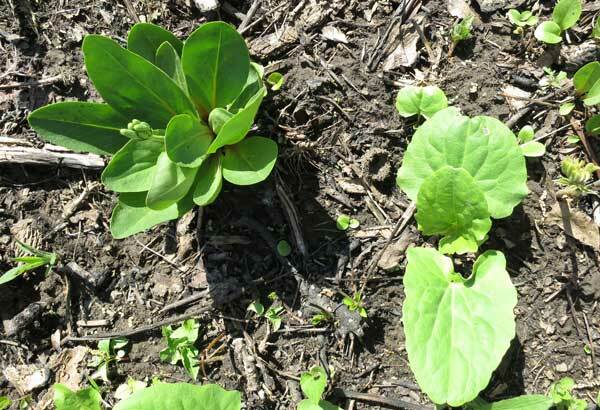 This photo also shows a number of PIP root suckers that are just coming up (the tiny plants just above the large PIP leaves). We try to spray all of these plants also, but will almost certainly miss some, in addition to those that are not out of the ground yet. Like any invasive species, one pass through an area is not enough, and I'll be back in this area about 3 weeks from now for another round. 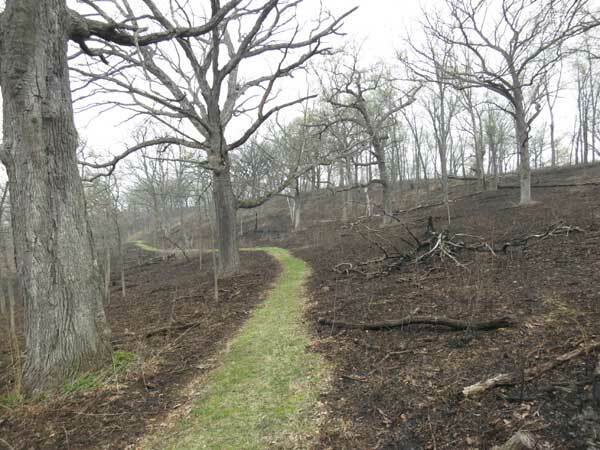 If you have a lot of invasive plants, either herbaceous or woody, then annual burns should be mandatory. Such a burn top-kills the woody plants and "starts the clock" on the herbaceous ones, letting you spray all the bad plants when they are small. Of course, different species appear at different times. 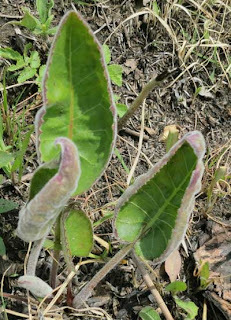 The herbaceous species come up first, but by the middle of May resprouts of woody plants start to appear. Brambles and honeysuckle are first, but buckthorn and sumac are soon after. Nothing is more enjoyable than to spray a small resprout of one of these plants and know that you have eliminated it from the system. Our wetland is part of a larger complex that extends up and down East Blue Mounds Creek and various side creeks, such as Pleasant Valley Creek, Ryan Creek, and Elvers Creek. For the Driftless Area it is a fairly large wetland. Even the immediate part that our property connects with is about 150 acres. 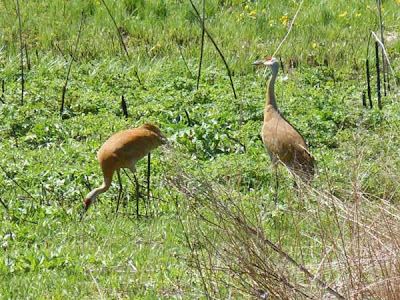 When we first were here (1980-1983) there were no sandhill cranes at all, and we first started to hear them about 1985. Since then they have increased substantially. We had confirmed nesting (visible nest) on our property in 2005 and since then they have been nesting (babies seen) somewhere in the wetland complex every year. We are fairly certain we have a nest this year, and Kathie and Amanda have been clicking away with their cameras. 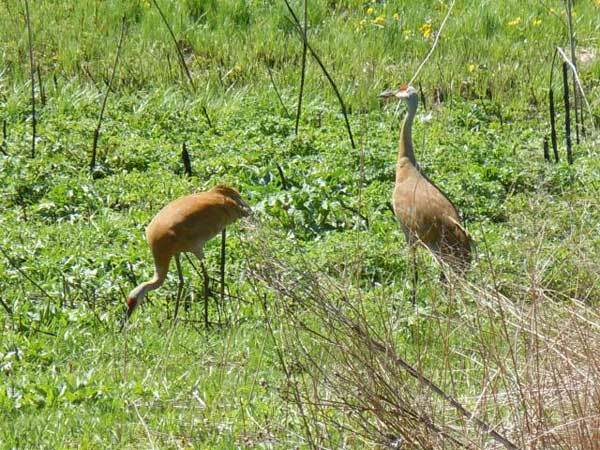 Kathie's photo here, taken two days ago, found the cranes close to our cabin, in an wetland area that we had burned on March 13. Note how lush the vegetation is. 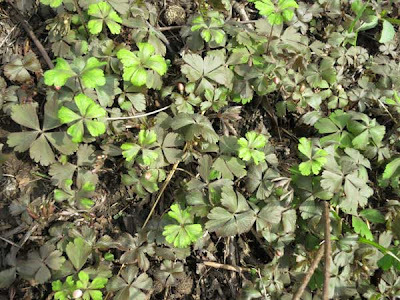 Most of those plants are probably glade mallow (Napaea dioica), which is having a banner year. One reason why the cranes are nesting in our part of the wetland this year might be because we have been finally been able to put a damper on beaver activity. For the past several years a lot of our wetland has been flooded, but this year an intrepid volunteer trapper has been able to reduce the population and remove the key dam. We can now walk again through the sedge meadow. For the past four years I have been participating in the rise and fall of clones at the edge of one of our bur oak savannas. We have spent a lot of time (and herbicide) eradicating a clone, only to watch it be replaced by another clone. This post will end with the 4th clone that has occupied this site. This has been an interesting experience and makes one realize how difficult restoration ecology really is. 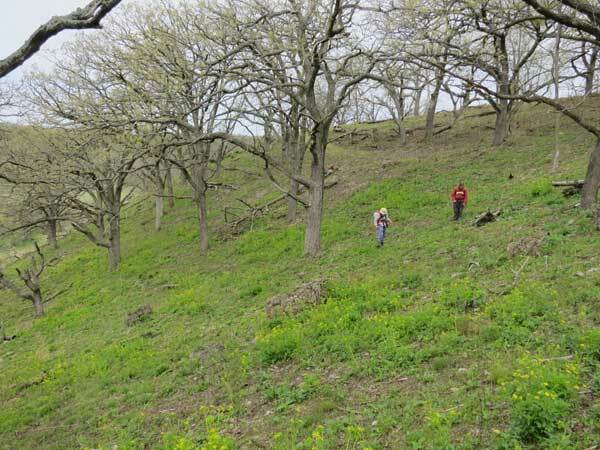 For anyone who is following our work in detail, the site is part of Unit 23, just at the top of what we call the Hickory Ravine, and close to the East Overlook. The site was cleared of "bad" vegetation in 1999-2000, and has been burned annually ever since. There are lots of nice bur oaks here, plus substantial prairie remnants. Just a few yards away is a spontaneous population of purple milkweed, a State-Endangered species. The area always burns well, which is significant since two of the clones we have dealt with are woody. About five years ago, after the area had been opened up, part of it became infested with Rubus idaeus (red raspberry), which is one of the more difficult bramble species to get rid of. Red raspberry forms very dense clones, with the canes so close together that almost nothing else can grow. Although other Rubus spp., such as blackberry and black raspberry, are relatively easy to eradicate (cut and treat or basal bark does the trick), red raspberry is difficult to get rid of in that way. I had a detailed post on this menace in 2010, which should be accessed for details. In brief, the procedure we used was to spray all resprouts that came up after a burn with Garlon 3A, canvasing the area carefully in May and early June, returning twice or (preferably) three times to get the late-growing resprouts. We were successful with this procedure, but the next year the area was replaced with a vigorously growing clone of smooth sumac (Rhus glabra). This is a serious problem also and is only slightly easier to get rid of than red raspberry, using the basal bark technique with Garlon 4 in oil. I've got a detailed post on this also. We eradicated this in the summer of 2010. However, it seems like restoration work is never done. Late last year the same site was infested with pale Indian plantain (Arnoglossum atriplicifolium) , another fierce clone former that can also take over a whole site, at least in Pleasant Valley Conservancy. I have got several posts on this species also. So this spring Kathie and I have been spraying all the pale Indian plantain root suckers, both large and small (some as small as 10 mm in diameter). We are confident that we can eradicate this species here, since the same technique (repeated spraying the same summer) has worked well at other sites. Interestingly, this site is now being taken over by another strong clone former, but one that we are happy to have. This is wood anemone (Anemone quinquefolia), an early spring bloomer that seems to be well behaved. The photo below shows a small part of the tight mat that is moving in to this site. I hope I am not wrong about wood anemone, since I have seen reports that in some places it has formed mats of up to an acre in extant. However, we have had this species at Pleasant Valley Conservancy ever since we started restoration, and it has not gotten out of hand. We'll see. 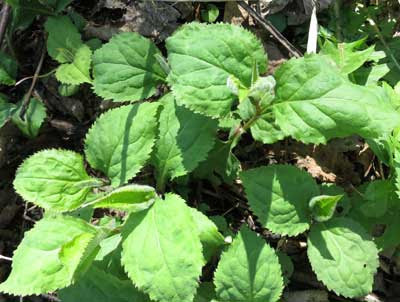 Although those dealing with garlic mustard may not agree, clone-forming species are the greatest challenge to the restoration ecologist! I gave a paper on buckthorn eradication at the IPAW meeting in Milwaukee in December 2011. I finally got around to editing this to make it more usable without my speech. I have converted it to PDF. The file is a bit large (13 MB) but it only took me about 30 seconds to download it with a broadband connection. The link is below. The advantage of early burns is that once the burn has eliminated last year's thatch and duff, new growth is easy to see. (If you can't burn early, consider burning the previous fall---conditions permitting.) One can get an early jump on spraying weeds or other undesirable plants that come up early. Right now conditions are perfect for spraying one of our bugaboos, pale Indian plantain (Arnoglossum atriplicifolium), which I have wailed about in earlier posts. This clonal species is an early starter, and many of the stands we have contain dozens of plants, from very tiny to substantial in size. It won't be long before our crew will be spraying this species, but at present they are still occupied planting seeds in recently burned areas. In the meantime, I am getting an early jump. Last week I sprayed all the plants in a clone that came up in the bur oak savanna at the top of the the south-facing slope (which had been burned 13 March). I counted plants as I sprayed them (149 plants), which was lots smaller than the 1000-plant clone I sprayed early last spring. Yesterday I sprayed new plants coming up in the Valley Prairie, which had also been burned on 13 March. 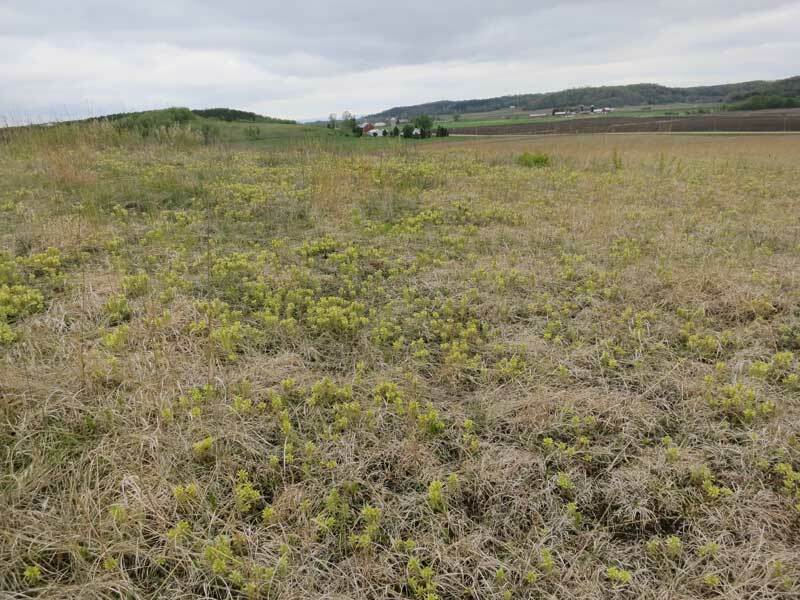 Since most of the habitat in the Valley Prairie is wet mesic in character, plants tend to grow bigger and lusher. This includes not only PIP (as we call it), but lots of good plants, so it is important to be careful when spraying. Several species which are already up in the Valley Prairie include prairie dock, cup plant, rosin weed, golden Alexanders, rattlesnake master, stiff goldenrod, Indian grass, little bluestem, etc. etc. 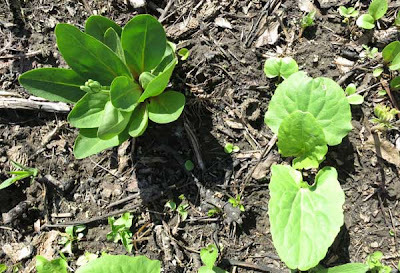 The photo below shows a PIP next to a prairie dock. This is a medium-sized PIP. Some of the plants in this area were just barely visible, whereas others were twice as big as this one. Of course, we don't just spray PIP. Any red or sweet clover or birds-foot trefoil is sprayed, as well as Canada thistle, motherwort, or catnip. The herbicide is 2% Clearout (a generic glyphosate). I prefer to use glyphosate at this time of year because there is no soil residual. If the target plant is close to a "good" plant, then it is important to avoid any herbicide on the latter. With a good nozzle on the backpack sprayer, it is possible to be quite specific. Since glyphosate is inactivated by soil, any chemical that gets into the soil is safe. Our large savanna burn of 29 March was a major success, resulting in over 30 acres burned. The coverage was close to 100%, which is quite an improvement from our experience a few years ago. The view here, in the midst of what we call the Basin Savanna, was taken two days after the burn. We have a definite philosophy about mop-up. We only put out smokers if they have the potential for being a hazard. Because of the large size of our burns, we have very little edge effect. When we did the 29 March burn, all of the land on all sides of the savanna had already been burned and was black. We let flaming logs that are on the ground burn up. The photo below shows what happened to a large hickory that had toppled last winter. It caught on fire during the burn and although it rained a few hours after the burn was completed, the logs were still burning the next day. They continued to burn and in fact are still burning at this moment. The upper photo below was taken a week after the burn and lower one three days later. You can see the gradually lengthening gray ash which shows the outline of where the logs burned. In the second photo, the ash layer is about 12 feet longer. These logs are burning only at the end, the fire gradually eating into the log. We could easily put them out, but since they are surrounded by a vast area of black, it is preferable to let them burn. These photos also provide a good view of the Basin Savanna. The oaks on top of the ridge are mostly burs and those lower down are whites. 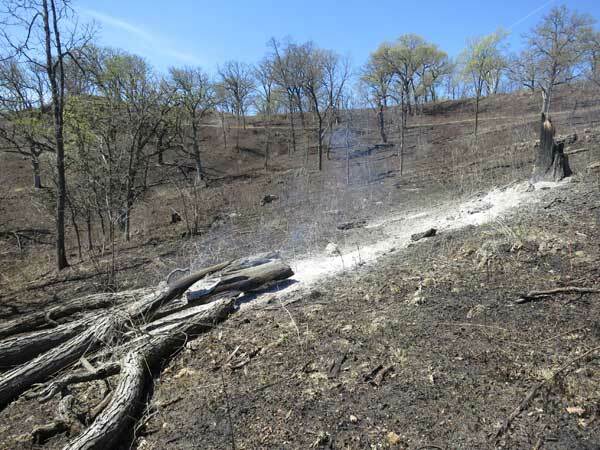 How often should an oak savanna be burned? There is extensive data from the research at Cedar Creek Natural Area in Minnesota. The results indicate that frequent burns are desirable. This agrees with work done in Iowa at Timberhill Savanna, and in Wisconsin by Rich Henderson. "1. Decrease the abundance of non-oak trees and shrubs (and get more light to the groundlayer). I call this restoring the vertical structure. 2. Control or eliminate pest plants. 3. Burn annually, at least for five to 10 years, and then burn as needed on an irregular pattern. 4. Add species, if and where needed." At Pleasant Valley Conservancy, because of our long legacy of buckthorn and other invasive shrubs, we plan to burn annually into the foreseeable future.